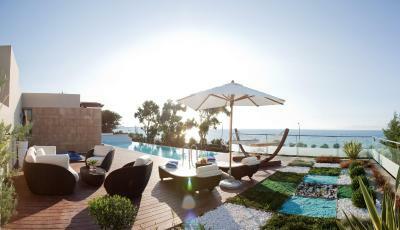 Lock in a great price for Amathus Elite Suites – rated 9.1 by recent guests! Food at hotel and in area was fantastic. The staff at the hotel were excellent, very friendly and helpful. A day trip to Symi was superb. We wanted a nice quiet room, with a balcony and view we could have a relaxing week at and Elite Suites was perfect for that. 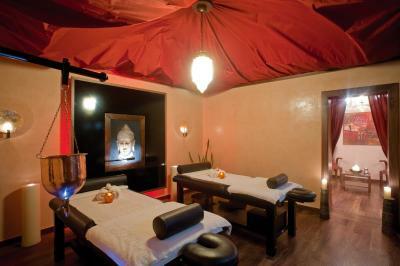 It also in a great location, on the main road about halfway between the airport and main town. There are plenty of local eating places in the local high street only a couple of hundred yards walk. We had a great time there and highly recommend it. Henkilökunta on aivan huippuluokkaa, palvelu on viimeisen päälle hiottua. Jo sisään kirjautuminen on tehty miellyttäväksi, kun asiakkaalle tarjoillaan heti shamppanjaa ja siinä samalla hoidetaan muodollisuudet. Tämän jälkeen huoneesta löytyi lisää kuohuvaa ja hedelmäkori hotellin johdolta. Aamiainen oli todella monipuolinen ja herkullinen. Huone oli upea, sieltä löytyy kaikki mitä vaan voi toivoa ja jos jotain ei löydy henkilökunta hoitaa asian tuossa tuokiossa. Huonepalvelu toimi hyvin, siivooja käy kahdesti päivässä. Oma uima-allas ja pieni puutarha oli ihana. Hotellissa on hieno kylpylä ja monenlaisia palveluja. Todellinen hemmottelu ja luksuslomapaikka. Palaan sinne ehdottomasti uudelleen. ארוחת בוקר נהדרת עם מבחר גדול ואופציה להזמין בנוסף מהמטבח, כל הצוות כולו פשוט נהדר, יחס מקסים. עוזרים מאוד, אדיבים מאוד, זריזים מאוד. האוכל טעים, הבריכות והמתקנים במקום נקיים ונעימים. אין מילה אחת רעה לומר..
שירות מצויין מעל ומעבר..הייתי מצפה שהמלון יהיה טיפה יותר חדיש אך מאוד מפנק ושירותי! La chambre était vraiment jolie et spacieuse. Le petit dej était top. O quarto era excelente, a limpeza, o atendimento dos funcionários, a recepção no check in, a atenção dada aos hóspedes, um dos melhores hoteis que já me hospedei. Fiquei encantando com tamanha preocupação em servir e prover uma excelente estadia. Recomendo muito este hotel! 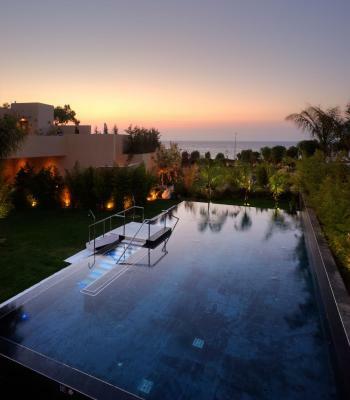 Amathus Elite Suites This rating is a reflection of how the property compares to the industry standard when it comes to price, facilities and services available. It's based on a self-evaluation by the property. Use this rating to help choose your stay! 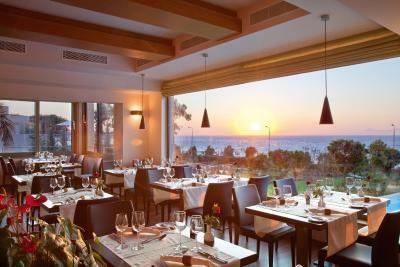 5-star Amathus Elite Suites stands on the picturesque coastal resort of Ixia, 2.5 mi from Rhodes Town. 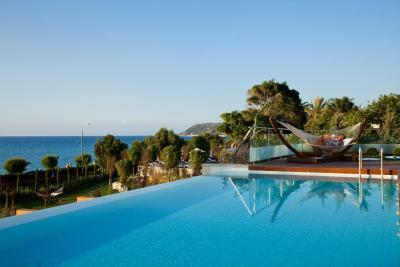 Guests enjoy direct beach access, and free use of the gym, sauna and steam bath. 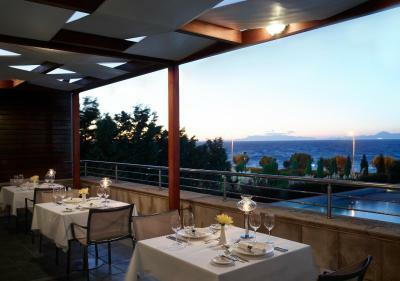 All suites have uninterrupted views of the Aegean Sea through floor-to-ceiling windows. 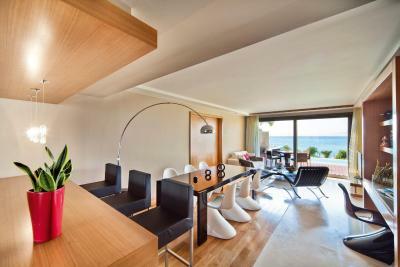 The sophisticated suites have a living area with a corner sofa bed. The bathroom has a full-length tub, separate shower, and two washbasins. 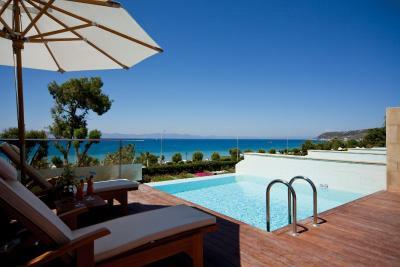 They all feature expansive terraces, several with a private garden or private pool. 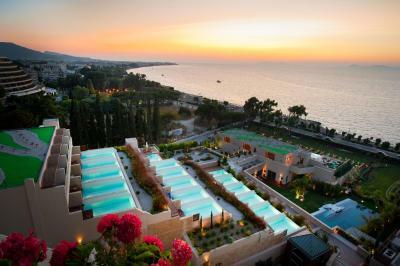 Guests enjoy 3 outdoor freshwater swimming pools, including one located on the 11th floor with a panoramic view over Ixia bay. 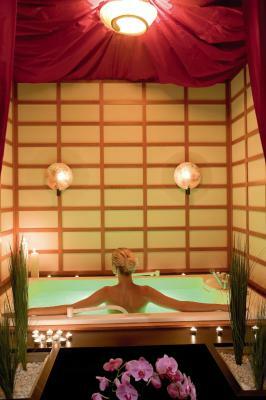 The 1,300-square-yard spa provides 14 treatment rooms, including a couple’s room. 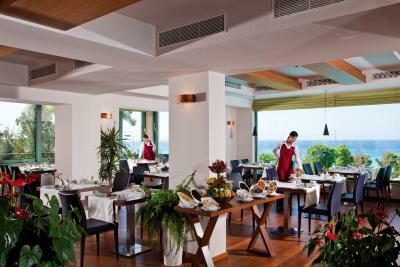 The Pool Deck restaurant is open for lunch, coffee and snacks, while the Varkarola Taverna serves international cuisine for lunch and dinner. Drinking outlets include a panoramic rooftop bar and a semi-submerged pool bar. Diagoras Airport is 6.2 mi away. The famous Butterfly Valley is 12 mi away. On-site parking is free. 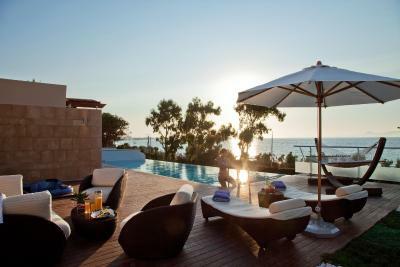 When would you like to stay at Amathus Elite Suites? 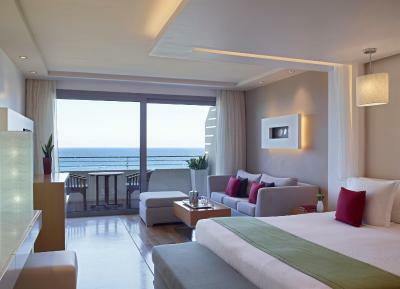 This sublime suite has all the features of the sea-view suite with private pool of 82 ft² with hydrojets, and is further enhanced with a lush garden. 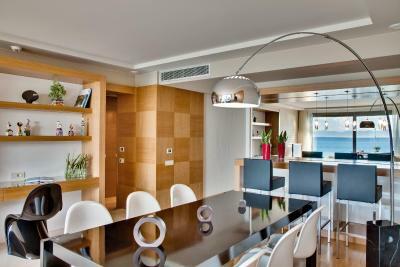 Uninterrupted sea views, a private pool of 82 ft² with hydrojets sets this suite above the rest. 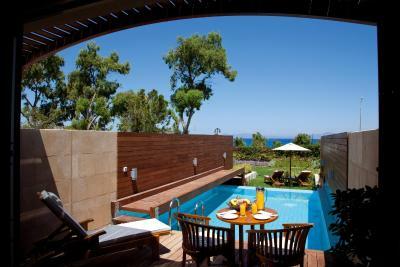 Located at the corner of the building, these suites offer an oversize wooden deck/terrace on the side furnished with two sun-beds and two chairs. 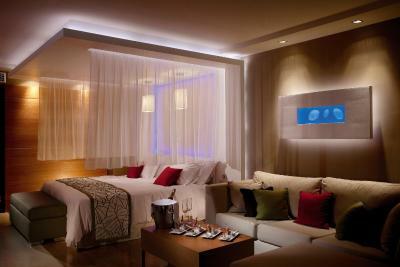 This suite features a balcony, soundproofing and satellite TV. 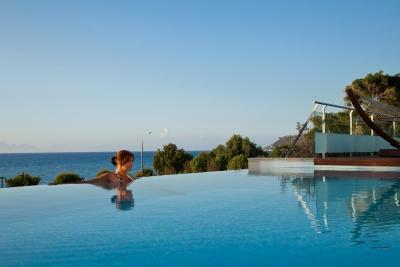 5-star Elite Suites by Amathus stands on the picturesque coastal resort of Ixia, 4 km from Rhodes Town. 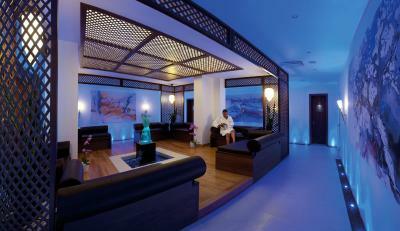 Guests enjoy direct beach access, and free use of the gym, sauna and steam bath. 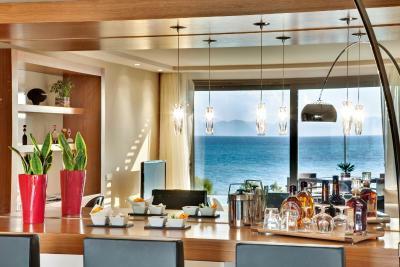 All suites have uninterrupted views of the Aegean Sea through floor-to-ceiling windows. 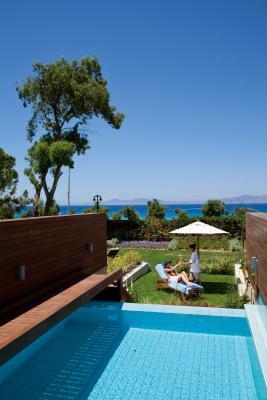 House Rules Amathus Elite Suites takes special requests – add in the next step! One child from 3 to 12 years is charged EUR 30 per night in an extra bed. One older child or adult is charged EUR 100 per night in an extra bed. 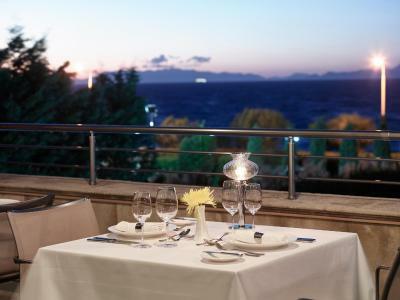 Amathus Elite Suites accepts these cards and reserves the right to temporarily hold an amount prior to arrival. A bottle of sparkling wine is offered to guests upon arrival. The area was scruffy- the bus stop outside hotel had no information, at night the beaches were covered in litter. A day trip to Rhodes was mixed- the historic buildings were fascinating but the surrounding area and the route to the Grand Palace was covered in litter and VERY dirty. Crazy when Rhodes was about to have World Tourism day in September. The only complaint I have is that on arrival a £500 authorisation was demanded from our credit card to cover any room service. Reasoning is "but we don't take anything" is irrelevant as it means we no longer have that money available to use. Combined with car hire at the airport doing the same, you lose over £1,100 spending money before you have even checked in. We had the credit, but it should be clearly specified exactly how much when you book. The booking says "may hold an amount temporarily or until after check-out" which is NOT true, as they don't cancel it when you check out, they leave it to drop off weeks later (I work in IT banking and know they could cancel it immediately if they wanted to). But the most irritating part of it is that when you have fully pre-paid £2500 for the room in advance, it is as though they don't TRUST you to pay for any room service when you check out.